A field training exercise at Naval Base Guam. Growing Chinese and Korean missile capabilities are forcing Washington’s hand with regard to the INF withdrawal. On October 20, U.S. President Donald Trump announced his intention to withdraw the United States from the Intermediate-Range Nuclear Forces (INF) Treaty, an arms control agreement that has been in effect since the late Cold War which limits the types of missiles Russia (formerly the Soviet Union) and the United States were allowed to deploy. Specifically, the treaty prevented either power from deploying intermediate range (1,000–5,500 km) nuclear or conventional missiles or their launchers or upper-end short ranged missiles which could strike targets over 500 km away — though it excluded munitions launched by aircraft and warships. The treaty came into effect on June 1, 1988 and according to a number of historians marked the end of the Cold War. It forced both parties to destroy significant portions of their missile arsenals, terminate a number of ongoing weapons programs and has seriously restricted the ability of either to diversify their strike capabilities. While Russia and the United States have since 2014 accused one another on numerous occasions of minor violations, the U.S. withdrawal from the INF can be better understood in the context of the growing threat to its power posed by military rivals other than Russia — specifically China and North Korea. The INF Treaty was drafted at a time when the United States and the Soviet Union were by far the world’s most militarily powerful nations, with neither country perceiving considerable threats to their military primacy from any third parties. The missile capabilities of both superpowers were well above and beyond those of any rivals, and as such, a treaty which bound them to limit their missile capabilities appeared an effective means of ensuring a more stable balance of power and an end to the costly arms race both had for decades pursued. In the 21st century however, while the INF treaty remains well suited to Russia’s security interests, continued adherence to the Cold War era document has seriously undermined the United States’ ability to contend with the growing strike capabilities of emerging “great power rivals” — a term used by the State Department to refer to major military powers capable of challenging the United States. China and North Korea in particular, while fielding negligible missile capabilities in the 1980s, today both possess highly capable ballistic missile arsenals — among the most diverse in the world, which pose a major threat to U.S. assets in the Asia-Pacific region. As the treaty restricts signatories’ deployments not only to Europe, but globally, and since neither Beijing nor Pyongyang are signatories to the INF Treaty, restrictions on U.S. missile capabilities are effectively unilateral in the Asia-Pacific. An example of how continued adherence to the INF treaty has undermined U.S. position in East Asia to the benefit of its regional military rivals is the case of the U.S. territory of Guam — which houses facilities key to the operations of the U.S. Navy, Air Force, and very soon the Marines, in the Pacific theater. Both China and North Korea have invested heavily in developing ballistic missiles capable of delivering nuclear strikes to the territory — the DF-26 and Hwasong-12, respectively. Both of these intermediate range ballistic missiles have been dubbed “Guam Killers” by analysts, with their range making them ideal for striking the U.S. territory. The ranges of both these missiles are well within the margins for banned munitions under the INF, but as non-signatories both China and North Korea are free to manufacture and deploy such munitions. 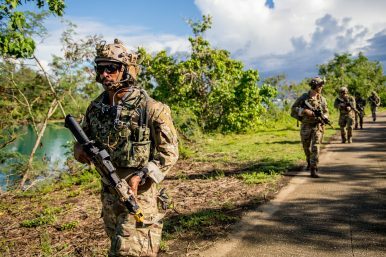 Reports from think tanks such as the RAND Corporation have repeatedly indicated the vulnerability of facilities on Guam, alongside those on Okinawa and Hawaii, to ballistic missile strikes from East Asian adversaries — a vulnerability unimaginable during the Cold War years. The United States on the other hand is unable to deploy intermediate range missiles capable of retaliating against the two Asian powers from Guam, Hawaii or Okinawa due to the constraints of the INF treaty. There are similar constraints on the United States’ ability to retaliate from the southern half of South Korea or from Cheju Island in the event of war on the Korean Peninsula — with all these facilities well in range of North Korean missiles such as the Hwasong-9 and Musudan but lacking missiles with similar ranges suitable for retaliation. Ultimately while the United States remains Russia’s only adversary with near peer capabilities, considerable changes in the global balance of power and in particular the evolution of the North Korean and Chinese missile programs have meant that the United States can no longer premise the composition of its arsenal solely on the basis of matching that of Russia anymore. Unless the treaty can be revised to somehow include other parties with major missile programs — unlikely as it would mean a de-facto recognition by the United States of the North Korean arsenal, or else to limit restrictions under the treaty to the European theater alone, it remains unviable for the United States to remain a signatory. While a withdrawal from the INF treaty has been cause for much concern for a number of European leaders, and is bound to lead to both the United States and Russia deploying a number of advanced new munitions to the continent with ranges unseen in 30 years, for the United States’ Asian allies which wish to see a continued U.S.-dominated balance of power in the region, America’s newfound freedom to deploy assets to counterbalance the growing power of its military rivals is likely to be welcomed. Abraham Ait is a military analyst and the founder of Military Watch Magazine. How Did Japan Lose Its Air Superiority Advantage?What Do Asian Governments Think About the US Strike on Syria?US and EU Separatist Groups to Gather on Moscow’s DimeRussia’s Pacific ParadiseWhat Does the US Military See as Its Greatest Threat?